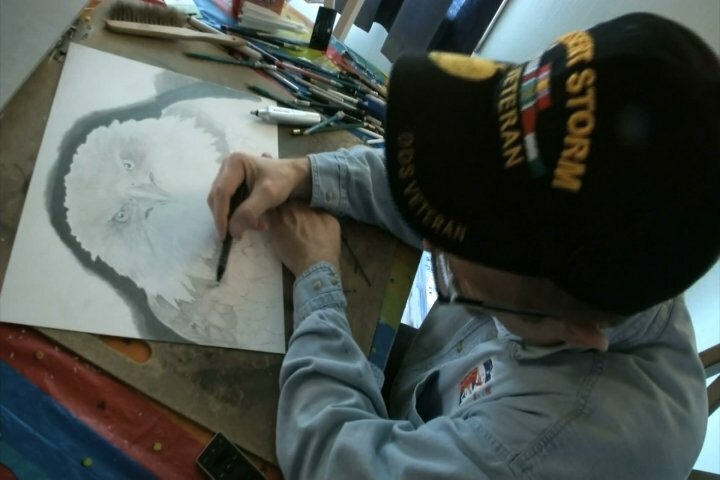 The man you’re about to meet is a veteran with quite a story, and he wants to use his talents to help other vets. Corey Adkins explains how in this week’s Northern Michigan in Focus. Army veteran Bill Richards was in Desert Storm in the early ‘90s. “When we were going through the Highway of Death, I don’t know if they have them or not, but there were bodies everywhere. The smell of death was unbearable and you can’t really get that out of your nose, and you don’t realize how fast life is over,” said Bill. It’s a dark memory Bill’s had a hard time dealing with, but he’s finding a way. “So even now, when I say what can I do, and I take that approach other veterans and what can I do to make their light shine, their life important, because life is so brief,” explained Bill. He’s doing this by expressing himself. And he’s also helping himself by helping other veterans with their demons. “Because I know the struggle that they are with and I believe idle hands are the devil’s playground. I’m not opposed to people taking medication, but there are alternative methods to dealing, maybe put a guitar in their hands or a paintbrush, so that is my main drive. Can I help another veteran out?” said Bill. Though he lives in Grand Rapids, Bill will help any vet that needs it.